From its picturesque snow-covered vistas to its epic ski slopes, Lake Tahoe is the quintessential winter-time tourist destination. 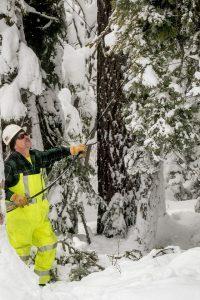 A big blizzard is generally a celebrated event in the Tahoe area, especially given the fact that the past few years have brought little snow to the mountains. But this winter, the extreme drought finally ended, and Tahoe got walloped with a series of massive snowstorms. Many of the area’s most popular resorts reported record-setting snowfall, with more than 23 feet during the first few weeks of January. But heavy snowfall meant a significantly higher-than-average number of outages across the region. The utility company that services the area, Liberty Energy, needed reinforcements, so they called in a dozen Local 1245 line crews from Par Electric, Titan and Summit Line to get the power back on. 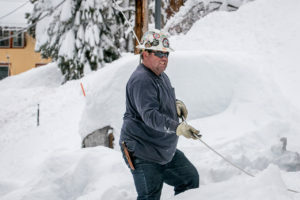 A lineman’s job is never easy, but the monumental blizzard conditions made the restoration work in Tahoe particularly difficult. The Utility Reporter caught up with Nolen and his crew as they were working in a residential area of Squaw Valley. 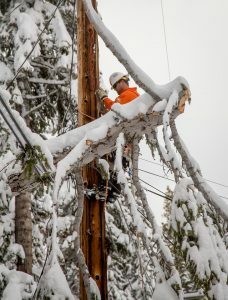 In addition to the challenges on the roads, the linemen also had to contend with blowing snow that resulted in decreased visibility, as well as freezing, wet and sometimes slippery conditions. But the skilled and seasoned crew took it all in stride, and set out to complete their task safely and quickly. On the other side of Mount Watson, another Par Electric crew was assigned to a larger outage, impacting about 100 people in a residential area just outside Carnelian Bay. Michael and his crew were faced with trees in the line and a downed primary, and had to reframe the poles and change out several transformers before re-energizing that particular part of the circuit. Despite the freezing, wet, windy conditions, the crew from Par didn’t complain. It’s clear that they love what they do and appreciate being able to bring power back to the residents and tourists who were affected by the outages. They were also happy and grateful to know that, even when the wind is blowing snow in their faces, the IBEW has their backs.